A camera that can "see" explosives, drugs and weapons hidden under clothing from 25 metres has been invented by The ThruVision. This system could be deployed at airports, railway stations or other public spaces. It is based on so-called "terahertz", or T-ray, technology, normally used by astronomers to study dying stars. 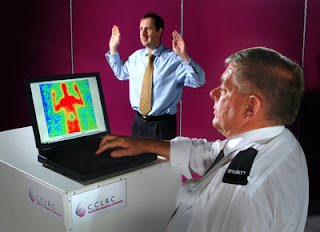 Although it is able to see through clothes it does not reveal "body detail" or subject people to "harmful radiation", according to the designers. "It is totally and utterly passive - it receives only," - said a spokesperson for Thruvision. Unlike current security systems that use X-rays, the ThruVision system exploits terahertz rays, or T-rays. This electromagnetic radiation is a form of low level energy emitted by all people and objects. These are able to pass through clothing, paper, ceramics and wood but are blocked by metal and water. The system works by collecting these waves and processing them to form an image which can reveal concealed objects. "If I were to look at you in terahertz you would appear to glow like a light bulb and different objects glow less brightly or more brightly. You see a silhouette of the form but you don't see surface anatomical effects." - said the firm's spokesperson. In addition, the system does not involve any of the "harmful radiation associated with traditional X-ray security screening", according to the firm. The company has made previous versions of the camera, but the T5000, as it is known, is the first that works both indoors and out. The system exploits technology originally developed at the government owned Rutherford Appleton Laboratory (RAL) in Oxfordshire. "Astronomers use T-ray cameras that can see through dust and clouds in space, revealing what lies beyond," - explained Dr Liz Towns-Andrews, of the Science and Technology Facilities Council which runs RAL. Other terahertz systems, developed by companies such as TeraView, are used to probe the structure of pharmaceutical compounds. ThruVision Ltd is a privately owned company based near Oxford, UK that was established in 2004 as a spin-out from the UK Government’s Rutherford Appleton Laboratory’s space research department, and with the support of the European Space Agency commercialised the robust proprietary terahertz imaging technology developed over many years for space borne applications. Today, ThruVision is the innovative market leader in standoff terahertz imaging solutions.